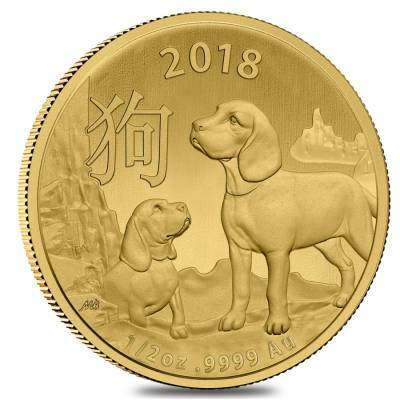 This amazing 2018 1/2 oz Gold Lunar Year of the Dog Coin honors the Year of the Dog; the eleventh animal of the 12-year Chinese Zodiac. The RAM releases the Lunar Series coins on an annual basis, with changing designs each year to reflect the current Zodiac animal. The Dog Chinese symbol and people born in this year are supposed to be intelligent, patient, and loyal. The reverse features a highly detailed image of two dogs of the beagle breed and the Chinese character for “Dog”, all encircled by the images of the 12 animals of the Chinese Zodiac and the moon phases.The obverse showcases the profile portrait of Queen Elizabeth II created by Ian Rank-Broadley. 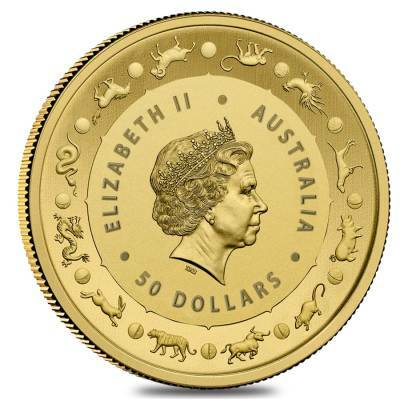 The coin is available in sizes of 1/20 oz, 1/10 oz, ¼ oz, ½ oz, and 1 oz, which make them affordable for any level of investors. These exceptional coins will be an excellent gift and a treasured addition to any precious metals collection. Made from .9999 fine gold, with a weight of 1/2 troy oz. Struck by the Royal Australian Mint. Coin condition is Brilliant Uncirculated. Individual coins come packaged in a plastic capsule. Face value is $50 AUD. 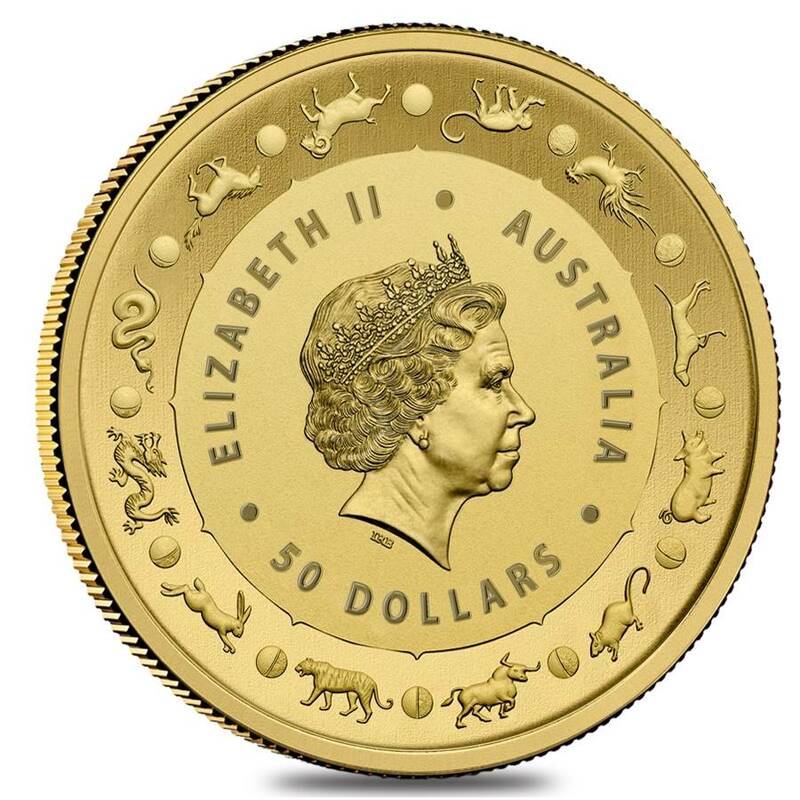 Obverse: Displays a profile portrait of Queen Elizabeth II designed by Ian Rank-Broadley, along with inscriptions: “Elizabeth II,” “Australia” and a coin’s face value - all of which are encircled by depictions of the 12 signs and moon phases of the Chinese Zodiac. Reverse: Features a beautiful image of two dogs, surrounded by the inscriptions: “2018”, along with the weight and purity, and the Chinese character for the dog. Bullion Exchanges offers you a great selection of exclusive items from renowned international refineries. Add this stunning coin to your collection today, and it will be carefully wrapped, packaged, and delivered to your address. If you have any questions, just call us at 800.852.6884, or send us a message, our customer service representatives will be happy to assist you. V fair price, best I found online. Perfect for my fellow Year of the Dog people! Happy to be able to pre-order this nice and early, and in time for Christmas! For every $1 spend, you will earn 1 Bullionaire Buck which is equivalent to $0.001 off a future purchase. 669 BB = $0.67.